By CNN'S LAURA JARRETT, JEFF ZELENY, KEVIN LIPTAK, EVAN PEREZ, VERONICA STRACQUALURSI, MANU RAJU AND ZACHARY COHEN CONTRIBUTED TO THIS REPORT. (CNN) - Washington is swirling with speculation about who President Donald Trump will choose to replace Attorney General Jeff Sessions after the President ousted his first attorney general Wednesday afternoon. 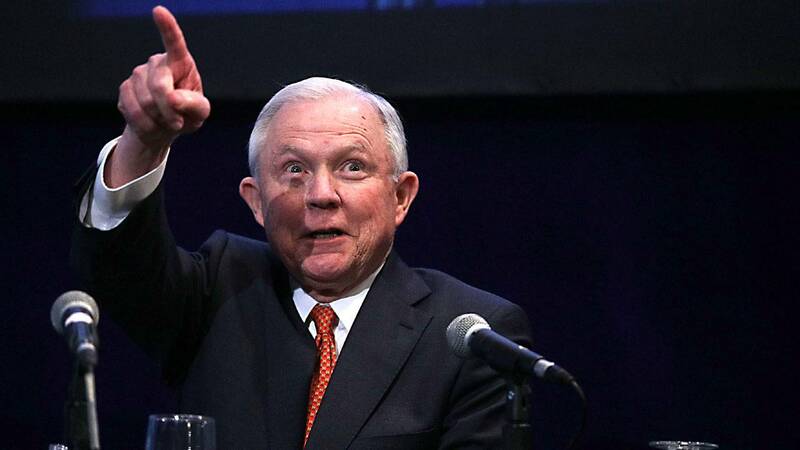 GOP Senate control will likely smooth the path for Trump to replace Sessions with a preferred name, and CNN reported ahead of the midterm elections that several prominent conservative legal figures were in contention to follow an expected Sessions removal. In the meantime, Trump said Sessions' chief of staff, Matthew Whitaker, would be the acting attorney general, with a nominee to come "at a later date." The following names have cropped up as potential Justice Department leaders: Whitaker, Solicitor General Noel Francisco, GOP Rep. John Ratcliffe of Texas, former Judge John Michael Luttig, Judge Edith Jones, former Judge Janice Rogers Brown, outgoing GOP Rep. Trey Gowdy of South Carolina and GOP Sen. Lindsey Graham of South Carolina. Named by Trump on Wednesday as the acting head of the Justice Department, Whitaker was previously Sessions' chief of staff. A CNN report in September, when Deputy Attorney General Rod Rosenstein's fate was openly uncertain, said Justice Department officials had prepared for Whitaker to take over for Rosenstein as the Justice Department's number two. Multiple sources told CNN that Whitaker spoke with Trump at the time about replacing Rosenstein and that Whitaker told people his understanding was that he could become the next deputy attorney general. Whitaker is a former CNN legal commentator and former US attorney who directed the Foundation for Accountability and Civic Trust, a conservative ethics watchdog group. He ran in the Republican primary for Iowa Senate in 2014. In a CNN op-ed written last year, Whitaker argued that special counsel Robert Mueller was "dangerously close to crossing" a red line following reports that Mueller was looking into Trump's finances as part of his investigation. At the same time Whitaker was considered as a replacement for Rosenstein, CNN reported that Justice Department officials had begun planning for Solicitor General Noel Francisco to step in as acting attorney general to oversee the special counsel probe. As solicitor general, Francisco is already one of the top authorities within the Justice Department and has regularly defended the Trump administration before the Supreme Court. Francisco came to the administration from the law firm Jones Day, where he worked with recently departed White House counsel Don McGahn. Ratcliffe was among those floated as a replacement for Sessions ahead of the midterm elections. Ratcliffe is a former federal prosecutor, and he won re-election on Tuesday by an overwhelming margin. His congressional biography touts his conservative bona fides and experience as a prosecutor, naming terror convictions in particular. He is a member of the House Judiciary, Homeland Security and Ethics committees. Luttig is a former federal appellate judge and Justice Department official who left the government to work as general counsel at Boeing. Before he left for Boeing during the George W. Bush administration, Luttig had been a finalist for vacancies on the Supreme Court, and he denied at the time that he was stepping down because of "the Supreme Court process." Luttig clerked for Justice Antonin Scalia, the conservative judicial icon who died in 2016. A source close to Luttig said he had been considered for the role of FBI director after Trump fired James Comey. Judge Edith Jones sits on the 5th US Circuit of Court of Appeals, and CNN previously reported that she might be in play as a replacement for Sessions. Jones, who like Luttig was once considered a potential Supreme Court nominee under Bush, courted controversy five years ago from civil rights groups after she was alleged to have said that she believes some ethnic groups are more prone to violence than others. Janice Rogers Brown has also emerged as a possible candidate. Brown, a former California Supreme Court associate justice and former US circuit judge, retired from the bench in August 2017 and moved back to California. A source close to her indicated that she would not be interested in the attorney general job and did not want to return to Washington. A Republican source told CNN that Gowdy, the chairman of the House Oversight Committee, was being floated as a potential replacement for Sessions. The outgoing conservative representative and former prosecutor became widely known during the Obama administration as he pursued an extended investigation into a 2012 deadly attack on a US mission in Benghazi, Libya. But he also repeatedly came to the defense of the Justice Department under Sessions' tenure as attorney general as Trump railed against Sessions and the special counsel investigation. At the same time, he has pressed the department for access to information and clashed with current and former top officials. Graham has wavered as much or more than anyone in his public opinion of Trump. Graham lashed out against him repeatedly during Trump's presidential bid, but following Trump's win, Graham emerged as one of his top allies. Following an emotional rebuke of his Democratic colleagues during the Supreme Court confirmation of Brett Kavanaugh, Graham's positive position among Trump's supporters has only ascended further. But, as with Gowdy, he repeatedly defended Sessions from Trump and called for Mueller's independence. He has also publicly denied any interest in leaving the Senate for a position in Trump's Cabinet, and he responded to the news of Sessions' ouster by reaffirming his desire to remain in the Senate. "As to me, I will be part of a larger Republican majority in the United States Senate -- working with the President and my Republican and Democratic colleagues -- to make America safer and more prosperous," Graham tweeted.